David and I went along to see The Groundhogs at the Barnard Castle Blues festival, which is a free event held as part of the Barnard Castle Meet over the May bank holiday weekend. We arrived in time to catch the last couple of songs from Sugar Kane, who are a blues band fronted by John O’Leary on vocals and mouth harp. 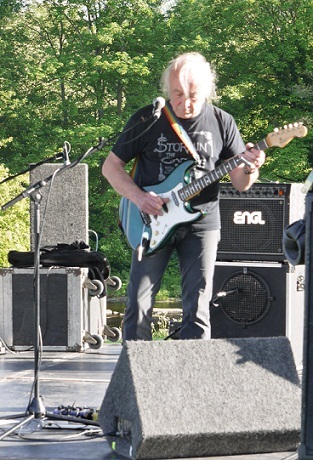 John comes from a strong blues pedigree, having been a member of Savoy Brown and the John Dummer blues Band in their early days, and he plays some nifty blues harp; the guitarist in the band is good too. Its been a year since I last saw Tony McPhee and the band, and I was interested to see how Tony was getting on. He had a stroke a couple of years ago; his speech has been affected and his wife Joanna has joined the band on vocals. Last time I saw them at the Cluny, Tony sang one song (Still a Fool). Tonight he managed two songs: Eccentric Man and Still a Fool again. Joanna’s dancing is as manic as ever, she’s backward and forward across the stage like a dervish. She was sporting a nifty hat for the first song. Tony looked well, and his playing was pretty good, although his guitar was seriously out of tune in Split 2 (too much use of the tremelo arm methinks). Good to see them again, and to hear a set of old favourites. 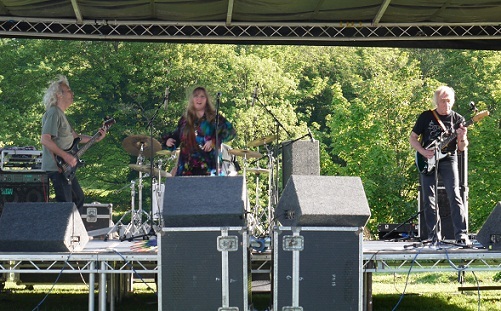 The current line-up of The Groundhogs is: Tony McPhee (guitar), Dave Anderson (bass), Carl Stokes(Drums) and Joanna Deacon (vocals).